"A quick, easy, and flavorful Mediterranean-style pizza, made with pita bread and topped with a lemon dressing." Mix lemon juice, garlic powder, oregano, and basil in a bowl; whisk oil into lemon juice mixture until dressing is well blended. Brush about 1 tablespoon dressing over pita breads and arrange on baking sheet; reserve remaining dressing. Combine spinach, tomatoes, and olives in a large bowl. Pour remaining dressing over vegetables and toss to coat. 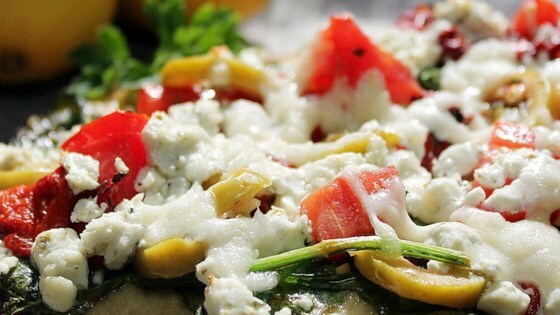 Divide spinach mixture evenly over each pita; sprinkle with mozzarella cheese and feta cheese. Bake in the preheated oven until cheese is melted and pitas are lightly toasted, about 8 minutes. Put whatever you like on your own “pizza.” Then make a sweet one for dessert! I didn't use all of the oil mixture and used less spinach. Also replaced green olives with kalmata olives. I didn't really like it and won't be making it again. Used fresh minced garlic, 4 tbsp. olive oil, Foldit flatbread to save calories, and Greek kalamata olives because I love the flavor. Delicious. I love an easy recipe that's healthy too. Good flavor, but I cut back on the olive oil to 4 Tablespoons, which was plenty. Thanks for sharing! I will make again. My husband was skeptical but ended up loving this!